The winds were strong, the sun warm and the skies clear. Most of my crew mates were below deck, clearing away another extravagant meal. Some had settled into bed, while others waited for their next shift. As I walked past the navigation desk, I overheard a disturbing conversation. An earthquake had hit Mexico a short while earlier and a 'tsunami alert' had been issued for the Pacific. That's where we were- halfway into our 3,000-mile, 16-day sail from Mexico to Hawaii. Was my 'quarter-life crisis'-inspired adventure about to become a nightmare? My journey began on a warm winter's day in Bangalore. I had recently completed a prestigious and expensive MBA in France. Disillusioned with corporate life, my parents' home was the ideal place to hide from awkward questions, at least for a while. The crew attempts to roll and change the sails on a particularly windy day. While hunting for unconventional careers, an ad on Escapethecity.org caught my eye. 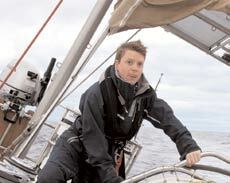 British adventurer Dave Cornthwaite was looking for crew to join him on his next expedition- a sail across the Pacific. I applied immediately and was accepted soon enough. It could have been my limited sailing experience or my ability to cook on a swinging stove in a storm. Two months later, I was on a plane to the Americas, equipped only with a small duffel bag. My destination was Cabo, San Lucas, a tiny village on the tip of California's Baja peninsula. That's where Dave and the 72-foot Sea Dragon were waiting to greet their new crew. Over the next few days, we cleaned, shopped, stocked, unpacked and tidied as we prepared the boat. A process of self-selection ensured our crew was filled with well-travelled, open-minded people with unfettered imaginations and a lust for life. We set sail on a Wednesday and our hearts were hungry for the seas and the adventures they held. That enthusiasm lasted a few hours before the first crew members turned a pale green. My own eager attempts at cooking were marred by sea sickness and an accidental (honest! ), generous addition of chilli flakes to the pasta sauce. It took two days before everyone found their sea legs. It took more than a week before they allowed me near the chilli again! The gorgeous blue and yellow dorado fish served as dinner on many a night. For the most part, life was one long, uninterrupted sail. Attempts to establish days or dates were pointless. Our time was marked by sunrises, sunsets, the sighting of a bird or boat, the moon or a sumptuous meal. One evening, just as we were getting off our shift, we heard a yell from above deck. As we rushed upstairs, we were greeted by the most divine rainbow I've ever seen. In fact there were two rainbows wrapping the boat between sky and sea. The ends started and dipped back into the water with the colours reflecting off the glittering surface, the ocean lit up by the dying rays of a setting sun. The sky would provide us many breathtaking moments. One night, the wind ceased. Our speed dropped to a mere three knots. Not long after, we were standing still. It was midnight, in the middle of the Pacific, and we had no control over our boat. Almost on cue, the clouds above us cleared. Then the stars made an appearance. One by one, they shone into view, occasionally followed by a planet or two. As we stared up at the heavens, what had been dark clouds and mist just a few minutes ago had now transformed into a diamondstudded carpet. Pure magic. Life on board certainly wasn't as spartan as we'd thought, especially when it came to meals. While the Sea Dragon was a dry boat (no alcohol), we managed to cook everything from burgers and chips to pasta, Chinese stir-fry, a Portuguese stew and Austrian Snitchzels. Spirits on the midnight watch were greatly lifted by hot chocolate and marshmallows. Of course, the process of getting food on the table, thanks to the constant rocking, was always tricky. The veteran chefs would wedge dishes into nooks and crannies, then balance on one leg while using the other one for support, and chop meat without having knives flying around the galley. This was Masterchef crossed with Cirque du Soleil. The best parts were the adrenaline-filled moments when we had to change sails in the middle of the night. This involved strapping into a safety harness, switching on a headlamp and walking along the narrow sides. Then we battled with the sails, tugging, punching and beating the enormous dacron to the deck. 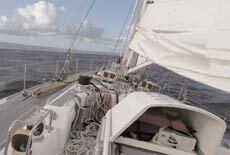 "Pull harder" came the order, as I entered into a rhythmic dance with the rope that controlled the sail. It wasn't long before the crew discovered my saree-draping skills could be effectively transposed to folding and packing the enormous storm sail. Not once but three times, I was called up on deck to help put it away. Without a hint of irony, I'd instruct far more experienced sailors who teased the fabric into tightly-packed folds just like the neat pleats of a wellstarched cotton saree. Even fishing was like a Bollywood sequence. 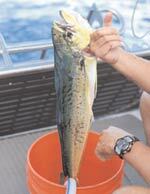 First the fishing rod hanging off the back of the boat would whir loudly. Someone would shout, "Fish! We've caught a fish". At least three photographers would emerge, equipment in hand, to capture the final breath. The captain would rush to take the helm. Other crew members would take positions to adjust the sails and slow down the boat. "Pull the Yankee", came the order from the captain. And hey presto, yellow and blue Dorado would rise out of the ocean and flap furiously onto the boat -ready to be turned into dinner. The tsunami alert, which came after the Mexico quake, was deliberately played down. For a few days we were rocked by swells so huge, they blocked our view of the horizon. But as they say, the best place to be during a tsunami is not on land but out at sea. I believed the advice and managed to stay relatively calm. Our first sighting of Hawaii happened at night. It appeared as a glowing mass on the horizon; almost as if the sea was giving birth to the Moon. Like the end of any great adventure, docking at Kewalo basin was bittersweet. The journey had transformed us. Like disciplined sailors, we tidied up, packed our bags and came ashore for our first meal on dry land. My response to Emily Penn, the First Mate, that night, was telling. "Let's go home. I am exhausted," I told her after our short walk to the restaurant and a long meal amongst other people. The Sea Dragon had become my home, one that kept me sheltered and safe at sea. After her adventure, Monisha decided to skip a cubicle-enclosed career and has accepted an offer from a luxury yatch company.